That was a great Craigslist find! The Jax can has skyrocketed in value over the last few years. Bought 3 different sets of Carling Black Label collections over the last month and received all 3 within the last week or so. One came from Australia, one from England and one from the Netherlands. Out of the three collections, I obtained 70 new cans for the shelf. Not often that I add that many new cans over such a short period of time! Oh that’s nuts. How did you run down these sets ? You need to send that to me!!!!! 30+ years and I cant seem to land this Ale!!!! It was just pure chance that all three auctions came up in the last month. "Klassnines" from the Netherlands always has quality foreign sets of cans for sale on ebay and his website. He is THE man for foreign cans online. After a couple of initial purchases, the guy from Australia let me cherry pick his auctions/Black label cans for any cans I wanted "since he found my name in the BCCA roster". He actually had several more that I did not have but the condition was pretty poor so I passed on those. The guy from England started with a purchase of one can and follow up emails established even more that I wanted. Oh and it’s like Christmas and even better. Mailman was late today! One more for the soda collection. Welcome to the club! Great cans. Well I’m ending this Birthday week with two more gems. One of my best weeks ever. Some Energy and Chocolates for a side collection. Also Not seeing the Slenderways in the book. Any thought on rarity? I don’t think I have ever seen them on eBay before. On Wednesday, I received a can for my CANvention cans collection. The 1973 John Paul yellow conetop. It will rotate after you click on it. So now, does anyone have a blue 1973 conetop (see 2nd pic)? Or any other color than black, yellow, or blue? Not Vintage but had to have it to go along with my Mountain Dew and Hill Billy stuff. Paper labels? If so what's underneath? Bill, The paper labels are glued to the cans, not taped. So I do not intend on checking what is underneath. From the yellow cone picture above, you can see the blue color near the seam. Both cones have a flat bottom and are probably not beer or soda cans. The blue 12 oz does not give up any clues. The black 12 oz has on the top, Busch and Please Don't Litter. You can see white to the bottom with blue at the seam. The yellow 12 oz has yellow near the top with silver stars about 1/8" down. 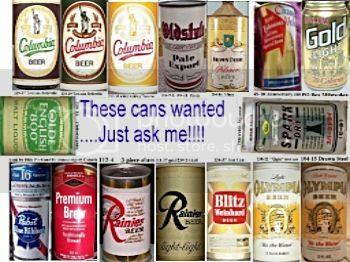 I'm sure all the cans were common in 1973. Cool. Thanks for the additional info! A few new acquistions; White Miller and first Gold Miller are from Azusa, CA, second 2 Millers are both from Fort Worth, TX. I'm sorry about the poor quality photos. Recently acquired cans. All but the Red Fox (withdrawn free), Schmidt’s quart & Tennent’s FT were acquired via some good old ‘cashless’ trading with RBers. Great group of cans. They look good together too. Nothing like a solid trade. Congratulations! The Dawson's flat is stunning. Clean metallics and I'm like a monkey with a shiny object. I was wondering what happened to that Walter's Bock....All of a sudden it was gone!